Intel has unveiled the processors that will form the core of its product line from 2009 onwards. 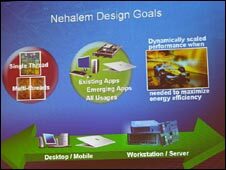 Details about Nehalem, now officially called Core i7, were given at the Intel Developers Forum in San Francisco. The chips will appear in laptops, desktops and servers and with them Intel aims to boost processing ability, cut power use and improve graphics. "Nehalem will be the backbone of Intel for years to come," said Intel fellow Rajesh Kumar. "It provides the best of both worlds," he said. "Higher performance and energy efficiency are not mutually exclusive if you innovate enough." With Nehalem Intel has combined memory and processing functions into a single chip instead of using two. On the most powerful Core i7 processors this will result in as many as eight processing cores co-existing on a single chip. Intel claims the innovations on the family of products will offer three times the memory bandwidth of the previous generation of chips and twice the performance of 3-D animation. Nehalem is also able to ramp down its power demands thanks to a "turbo mode" that turns off parts of the chip that are not being used. 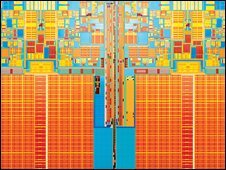 Intel also said the Nehalem design boosts the speed at which data can be shunted from memory in the computer to the microprocessor. With this technology Intel has matched a capability that rival Advanced Micro Devices (AMD) has been using for the last five years in its Opteron processor. Randy Allen, a senior vice president at AMD, said that it had its own advances on the way that will keep AMD ahead on performance and power efficiency. 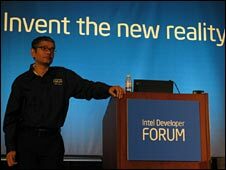 Mr Kumar, who helped to guide development of Core i7 features, told IDF attendees: "When you go into performance versus energy there is a trade off argument. We don't want to have that argument. "We want to give you a race car that gives you the miles per gallon of an economy car." Mr Kumar maintained the company has managed with Nehalem which he said would power everything from desktops to servers and from laptops to mobile devices. "As much as we get more efficient in how we use the battery we're always finding more ways to leech off the battery," Matt Eastwood, an analyst at market researcher IDC told Reuters. "A lot of these technologies that will be living on the periphery like Wimax are going to be pretty battery hungry," he said. Intel's chips are used in around 80% of computers while AMD has the majority share of the remaining 20%. "Right now it's Intel's game to lose," said analyst Cody Acree of Stifel Nicolaus. Mr Eastwood from IDC was also convinced by Intel's blueprint for how the computing world will develop. "Their overall story about the increasing graphics intensity running on our desktops I think that's absolutely true," said Mr Eastwood. "The vision they have there in terms of how they think that will all converge is credible to me."